How big can a lenticular be? Really BIG! Most lenticular projects call for prints that you can hold in your hand. Lenticular postcards are probably the most common application but covers, handouts, buttons, keychains and point of purchase displays are also super popular uses. But nothing has quite the impact of a large format lenticular display. How large can they be? Really large! Picture a mural that spans 100’ or more. While the largest single lenticular panel that can be produced is 4 foot wide by 8 foot high, those panels can be tiled together to create ever larger lenticular displays. In the past any animation had to be confined to within the perimeters of each panel. No longer. We can now “phase match” the panels to create one large coordinated display with the seams between panels disappearing. The result is breathtaking huge 3D and animated images. This photo shows a large lenticular display we created for Nike and the Oregon Ducks. This piece hangs in the lobby of the amazing new Hatfield-Dowlin Complex (check it out!) welcoming students and visitors with a 16’x 8’ display of the Ducks logo in all of it’s deep 3D glory. If you look very closely you can see the seams where the panels meet up. But all anyone notices when they walk in is amazing depth and color as it grabs their attention. While this piece shows off 3D, it’s also possible to show changes as visitors walk by creating more opportunity to get your message out. These piece can be installed in any number of ways and have no lighting restrictions. Although they can be backlit, there is no need for any special lighting beyond what you would use for any large format print piece. The panels can be delivered pre-drilled with holes to instal with screws, they can be stuck to the wall with Velcro or they can be insert into U-channel frames. Anywhere you can instal a traditionally printed large format display, a lenticular display can fit. The Oregon Ducks first project with us was a 3”x 1” label that went onto the front of the football helmets of the team. They followed that up with a 16’ long mural. That is a great example of the range of what can be done with lenticular technology. So if you have a space that needs a huge impact, give us a call to discuss creating the most attention grabbing display imaginable. 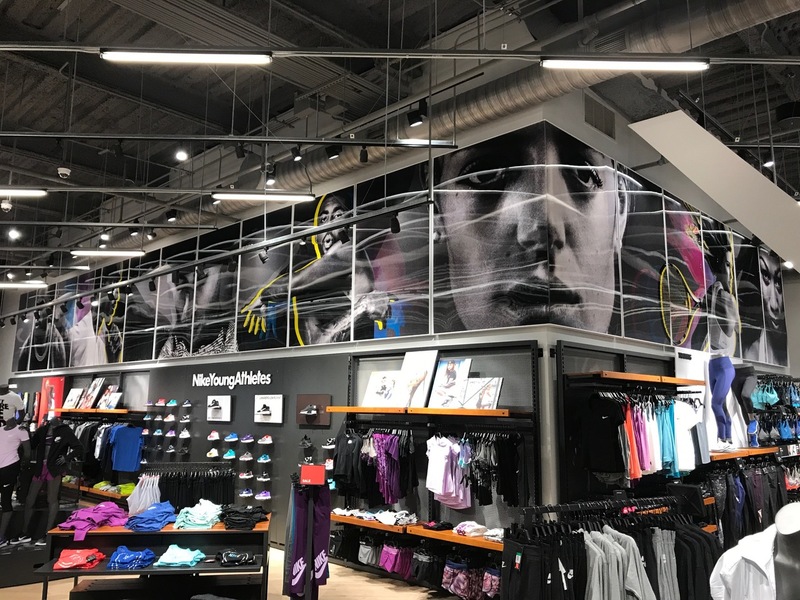 Whether it’s for a trade show booth, an architectural installation or a huge retail display, large format lenticular will grab attention, drop jaws and create real excitement!